This week's big release isn't in stores, as it is The Master Trials DLC for The Legend of Zelda: Breath of the Wild; for those that have paid out on the Expansion Pass on Wii U or Nintendo Switch it's finally time to enjoy some new content. 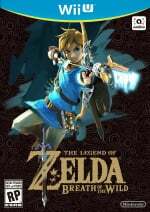 For players keen to play the game yet again (like this writer) there'll be the Hard Mode, and a big attraction is the Trial of the Sword, which is about 45 rooms of challenges to tackle in order to have a permanently charged up Master Sword. Along with a few other features there'll also be new outfits, which are the focus of a series of official articles from Nintendo. In these features key members of the development team introduce these outfits and give some context around their creation. In the Korok Mask post we learn a bit more about how the idea for having the little creatures in the game came together. In the Phantom Armor post we're given some background and history on how these characters featured in the DS games. Are you looking forward to the Breath of the Wild DLC this week? This game just blew me the hell away so more is always good. It's gonna feel like the longest week in the year, well this week and the week leading up to Mario Odyssey. I'm waiting for the second DLC. For $20, I want something a little bigger than "beat the same game again, but more difficult". I'm only really interested in the 2nd DLC pack. The real proper DLC. The costumes are nice, apart from the creepy Tingle outfit. And apart from the Korok Mask, none of them have any function that isn't already in the game. It's all too late anyhow, I've 100% cleared the game and collected all 900 Korok seeds so the Travel Medallion and Hero's Path Mode are no good to me. The Trials and taking on a Gold Lynel could be fleetingly interesting. Speaking of which, shouldn't a Gold Lynel be a new separate entry in the Compendium? I want to see the real DLC before I think I'll pay. The 1st pack should have largely been free and there at launch. So you're really paying €20 for something that will be a tiny fraction of the main game. I put roughly 490 hours into the game. 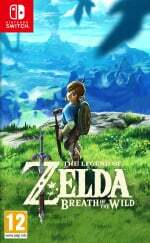 Will I get 220 hours from the DLC, which is 45% of the price of the game versus the price of the DLC? I don't think so. I doubt it'll even be a quarter or that. Don't know if I'd want to play through the whole thing again on hard mode after putting so much time in already doing all the Shrines but might give the Master Trials a go closer to when the story DLC arrives. Phantom Armour does look cool, will suit the two handed weapons nicely I think. Every time I get out...they pull me back in! 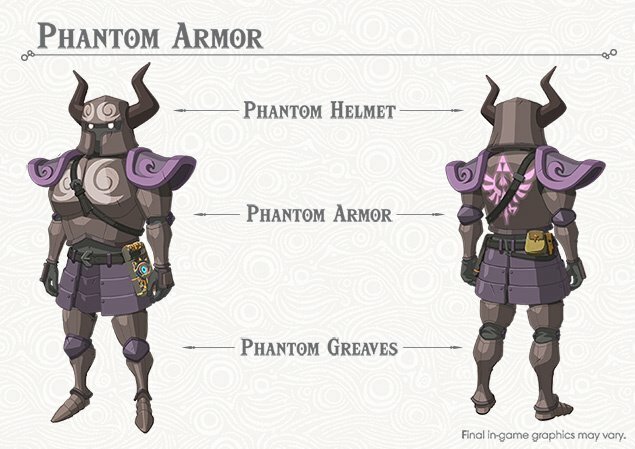 @Bunkerneath "If you wear this Phantom armor in The Legend of Zelda: Breath of the Wild, it will increase Link's attack power." @SLIGEACH_EIRE 1st DLC pack seems real proper DLC. Whining endlessly in every article. Are you getting paid for that? I'll definitely have to toggle Master Mode when the DLC comes out. Imma gonna fight me some Gold Lynels. Once the end of year DLC gets released and I complete that, then I'll be inclined to start a new game. Bought it yesterday after defeating Ganon. Still have a lot to do in Hyrule, so some more content is always welcome. @Cosats Says the guy who whines endlessly at my comments. You are that whining all the time ! Don't believe me ? Ask the mirror on the wall, who like to whine a lot in this site ? 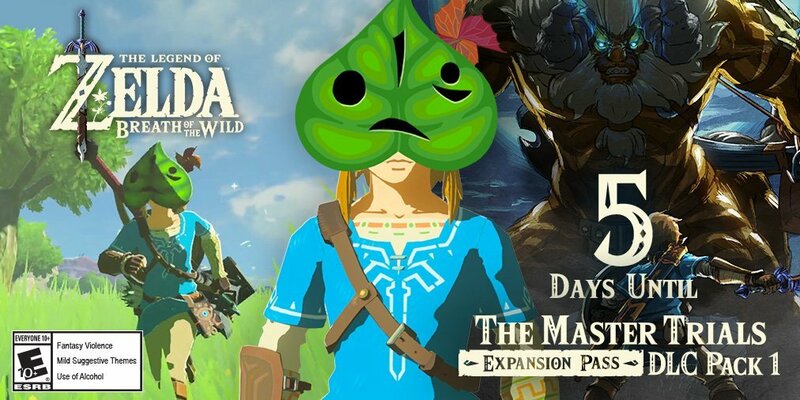 Anyway, the Korok mask ?? These are simply just add ons, so while I'm excited to get back into Zelda, arguably this should have been in it from the start, or added as a free update. The real DLC the we paid for is coming in the winter. @SLIGEACH_EIRE Are you referring to the three treasure chest that should have been free or this particular DLC? @UmbreonsPapa Both. Those chests and the Switch T-shirt were embarrassingly bad. There's 3 DLC packs. The one this week is really pack 2. I've put about 120 hours into the game and I still have one more Devine Beast to tame and maybe 3-4 unexplored regions to do before moving on to the final castle. This DLC is arriving just at the right time for me! I don't expect to 100% everything, but keep the good times rolling! Are you against Switch ?! Said Switch T-Shirt was embarrassing bad means you hate Switch actually. God dangit. I JUST finished the game last night (save one shrine and a few pieces of armor I haven't upgraded yet) and now THIS comes along! As Al Pacino once famously screamed, "Just when I was out...they PULL ME BACK IN!!" 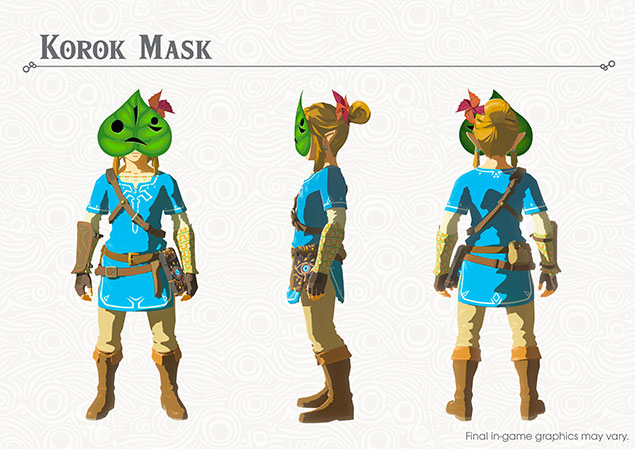 Other than the Korok mask (which I know makes it easier to detect Koroks), do the other armors actually do anything special? This upcoming DLC is very weak. Every time I see someone overly happy xcited about this I think it's either a Nintendo plant or someone who has never gotten real DLC from another Dev. Looks like I'm boxing up my Switch until Mario Odyssey is released. The long drought has begun. I'll decide about the season pass once the final pack is out later this year. I wonder if they add some kind of side quest for the new armor or if they just place some chests somewhere that you have to search for on your own. @Anti-Matter But the Switch shirt WAS embarrassingly bad! It doesn't do anything special, only gives you one point of resistance and you can't even upgrade it at a fairy. I stopped coming on so regular because I was sick of the switch hype train bullying people who weren't on it. I , like many others have an opinion and not a switch which is apparently a BAD thing. Please think before you post. Negative opinions are as valid as any other and Should be respected. Opinion sniping is just disrespectful and shows you don't respect others right to their own opinion, it's just childish. This community has been very respectful in the past and a pleasure to contribute to but I'm not sure how many times I will return just to see the likes of @SLIGEACH_EIRE get bullied for no reason other than having a different opinion to the 'average' fan. Sad times. I've spent 155 hours on Zelda and have not managed to find all Korok seeds. I was hoping to do so before the DLC release (just pride of not needing the Korok mask) but am still around 500 short. Really looking forward to the trials! I do take on board that some things maybe should have been in a free update, but the trials alone are enough for me to buy the dlc now, knowing that there's also more to come along the line. I really, really appreciate the game, so more is good. But at least, it's a Casual T-Shirt. I like casual t-shirt like that with Switch logo on front. Of course I will not wear that t-shirt for Serious battle like Lynell. Unless... you know, there are some Cheap Trick to defeat Lynell. My kids paid for the game, I told them I'd buy the Expansion Pass when this released, so I will. It does feel like I'm paying $20 to turn an invisible line green though as nobody will play hard mode in our home. This holiday will even things up. "Expansion Pass" still feels like stuff Nintendo lumped together b/c it was a last minute decision and they didn't know how to distribute it all. T-shirt and 3 chests - seem like a pre-order or Day 1 bonus. Nintendo even calls all them "bonus" before 1 and 2 but until this day they've never explained hown they are a bonus. If everyone who pays $20 gets them they aren't a bonus, just part of the pass. MK had a bonus for buying 2 at once rather than 1 at a time. Anybody buy it recently, is the shirt still there? Hard mode, green line, Trials - hard mode should have been in the game to start, maybe unlocked after you beat the main story. Green line on the map is apparently already there just invisible, not sure why anybody needs to pay for that, makes no sense if 200 hours is retroactive, but it should be included for ALL who spent $60 on the game. Trials could be $4.99 DLC. Story mode - That looks like a nice stand alone $15 add-on by industry standards, which I suppose is where they got the $20 from. But it just seems explained and bundled poorly on their part. And then unlike most games out there you have all the amiibo. I still haven't purchased Wolf Link, he's hard to find as they discontinued him, but it locks the pet wolf behind it. Why not include it in the expansion pass? Plus all the other amiibo items from the hard to find amiibo, Guardian sold out everywhere when it released. They lock things behind nearly impossible to find toys, they lock things behind an Expansion Pass. It adds up, and all for an offline only single player game. Still dreading the Mario Odyssey pass, we already have at least 3 amiibo. Or maybe it's 5? Hard to keep up. @SLIGEACH_EIRE I always thought the Switch shirt in the Wii U version was a bit of a kick in the teeth for players on that platform. We pretty much know it was delayed because of Switch. A Wii U shirt would have been nice, but I guess it was advertising. Advertising like that is always a bit dubious: "Enjoy your Wii U version. Enjoy it more on Switch." Also, would have been nice if they had given the shirt the same stats as another piece of armour and made it upgradeable so that it had value but wasn't a pay-to-win thing. I'd like the map feature to unlock when you have all parts of the map. That would make sense. And the Korok mask could be a gift from Hetsu when you've collected say, a hundred korok seeds. @Anti-Matter I didn't like the switch t shirt on BOTW. Is that ok with you. Does that mean I don't like the switch as a console. Am we allowed to have a opinion without you constantly whining. @Anti-Matter thank you very much for letting me have a opinion. I am in the same boat. I've got 420+ seeds but I'll be DANGED if any of the 500 remaining are remotely obvious. I'd imagine some are those accursed stones in trees, single stones sitting in the middle of nowhere, and perhaps puzzle types (like the "field goal" types I've done once or twice) that I'm too dumb to notice. 900 seeds, of which 50% aren't even useful. For collectaholics, it's hair-pulling time! @Gamer401 so do you only buy triple A retail games? There are currently over 60 games available for the switch- hardly a drought. At least one excellent game is released on a weekly basis. I have over 20 games and none of them are Zelda as I have it on Wii u. Start reading some reviews and checking out some videos- you're missing out on some gems. Nintendo started their foray into DLC so strong. Pikmin 3 extra maps were reasonably priced and offered good play value. Mario Kart 8 DLC blows most other DLC expansions out of the water. Smash Bros and Hyrule Warriors added new characters at good intervals and were reasonably priced compared to the rest of the industry too. But now in more recent times we get things like this, Fire Emblem, and (while not paid) limited distribution of mega stones that are tied to your current save file in Pokémon. Nintendo went from arguably the best, to arguably one of the worst in such a short time. @ULTRA-64 He gets "bullied" because he comes on Every. Single. Switch. post with negative comments. We get it. He doesn't like the Switch. That doesn't make it any less annoying. Seriously, just go and check the articles covering positive milestones for the Switch and there he'll be with a negative comment along the lines of, "Yeah, but it's not this or it's not that" or "The Wii did it better". What's wrong with someone being consistent? Wouldn't it be much worse if he gave in because he gets bullied and stopped criticising something he isn't happy with? Even worse, it would be very undemocratic if someone with a different opinion would get shut out of discussions (or feel unwelcome and stop participating in them) just because his opinion differs from the mainstream. The point of democracy is creating an atmosphere where a minority feels safe (and not bullied) to challenge the conventional/dominating views and where the majority will endure/tolerate (and listen to) those deviating views. So in that regard, I find your comment highly alarming. So what if he does it under every single Switch-related article? So what if it's annoying? That's the whole point. It's actually a good sign if it's annoying because that means there's still a discussion going on and not a total synchronization of beliefs. Nah not really. I dont think its a good dlc yet and i have enough to do with arms. But later this year ill try to 100 % it again (broken joy con made me fail it this time) on the highest difficulty. Lol the first time I saw the Phantom Armor I thought it was Shovel Knight. @darthstuey I buy titles that I'm interested in. I like open world games mostly, with a few Sci-Fi games thrown in there. I like racing games to, but not the rubber banding in Mario Kart. When Nintendo puts out games like Pilotwings, F-Zero, Waverace, Excitebike, and Metroid I'll be back. If they ever get any 3rd party games from R*, Take 2, Bioware, or any open world games like Just Cause 3 I'll take a look. But looking at what Nintendo is doing it will be a very, very long time before I buy another game for the Switch. I just remembered, back when Game Explain was doing their hour long videos dissecting the first BotW trailer, they made comparisons to the Hayao Miyazaki film Princess Mononoke. I find that even more so now with the way that the Korok mask shakes and rattles. In any case, does anyone have any idea how much space this DLC pack is going to take up? @shani This has nothing to do with democracy, and in many cases it's not even a discussion. Articles will merely be stating facts, like the Switch sold X number of units or Nintendo's stock is hitting a high--but there he is, ready to drop some negativity, no matter how irrelevant it might be. Having an opinion and a discussion is great, but he is that guy at a party who is constantly trying to poop on everything. @nomstar bigot - A person who is intolerant towards those holding different opinions. We all how a choice on how we behave. The world will always have an opinion different to yours, you don't have to offended. Tolerance is a choice we chose to make. @ULTRA-64 lol wow. Just wow. That is quite literally the saddest thing I've read in a while. If me commenting on how it is annoying that he is always posting negative comments and trying to bring others down makes me a bigot, I guess you're right... I'm definitely a bigot. Thanks for the lecture in tolerance from up on your high horse while you throw "bigot" around, I guess.